My mother-in-law has asked us repeatedly to put our names on the deed to her home. It's all kind of morbid, really, but it's not that she wants to pass down her house. That's guaranteed to us whether our names are on or not (and whether we want it or not! ), since my husband is the chonan (oldest son). No, she wants to pass on the free plot of land in front of her house. She has no yard, just a 70cm space in front of her house in which she stores her watering cans and hose. But she has a small garden plot that is lent to her rent-free by the power company that owns the land. In Japanese cities that sort of land is precious, more important to her than her home. I am not sure that the kids who participate in the urban gardening project in Plant a Little Seed see the land as quite that precious, but they do come to see both their effort and their products as precious when they raise a crop of goodies on their small plot. These two friends, along with their dog, rabbits, and moms, plant and mark seeds, then water and weed them, and after what seems to be an interminable wait, they harvest their bounty and have a feast. It is moving when they realize that their efforts have paid off and give thanks for both that and future growing seasons. The bold drawings seem reminiscent of block carvings, and the heavy borders provide a textured and appealing feel. Christensen portrays so many emotions through the illustrations, and the boredom of waiting for a long-off harvest is convincingly done. There is so much detail in here, from the rabbit family to a raccoon hiding, to all the different parts of the plants over their life cycles. I like that the plant cycle is shown from beginning to end, as this is one of the parts of our afterschooling curriculum for this year. It's also interesting to note how different a garden in North America is from in Japan- not a daikon in sight in this book! The end pages include extra information on the back of seed packages, a very cute way to showcase supplemental data. This is a bold introduction to urban nature for kindergarteners, which fascinated my kids while they were learning. 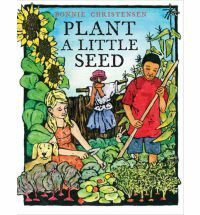 This book review is posted for Nonfiction Monday, hosted this week by fellow Canadian Apples with Many Seeds. I will be the host next week here at Perogies & Gyoza, see you then! I haven't seen your review yet! I love Kyoko Mori so much. Her memoir really affected me, having lived the opposite of her experience. I also like her middle grade readers like Shizuko's Daughter. I hope you liked it too! Thanks for participating in this week's Nonfiction Monday event. I've just picked this book up for the Doucette Library collection. It looks right on.